Part of the double-bill screening from Fingerclick Productions this month, director Daniel Taylor’s film squeezes its way onto the screen, and hovers uncomfortably. The film tracks a group of friends on a night out, focussing on an encounter between socially awkward James (James Quinn) and regret-laden Mhairi (Mhairi Rutherford). 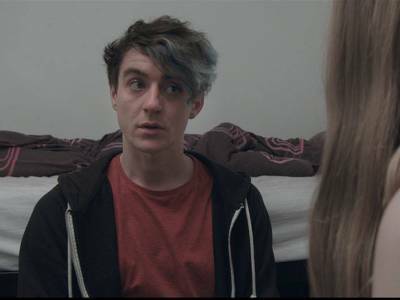 Being shot around Taylor’s hometown of Dundee, One Night Stand carries a clear indie aesthetic, and a cool simplicity that plays with a Realist approach to production. Likewise the film is shot without frills, the only flourish of editing coming in the first moments, as a fast montage piecing together the protagonist’s memories from the night before. Close-ups help viewers latch onto James in the opening shots, but back off quickly – the first act is mostly filmed with a static camera, pushing characters to the edge of the frame. Early scenes are claustrophobic, jarring and unsettling. Set design is sparse throughout – books in rooms are turned spine-in to the wall, creating a break in the otherwise highly realistic creation. Later, the fixed camerawork gives way to handheld shooting, closing in and becoming more intimate, with lighting becoming warmer. To Taylor’s credit, the characters’ paths reflect this: the actors begin by missing eye contact, sitting apart from one another. The script, rather than being a slick affair, is filled with painfully accurate smalltalk, delivered with perfectly niggling pauses. Intoxication allows the characters to make physical connections as well as emotional ones, leading to groups sitting closer together, sharing moments rather than isolating one another. There’s a sense that these characters have been written as facets of this same feeling – all characters share first names with their respective actors, and these are revealed gradually. James’ name is not spoken aloud for the first 16 minutes, Mhairi’s not until nearly midway through the film, as proceedings move physically from one stiff encounter to another messier but more friendly one. Things close with a melancholy sense of circularity, without any kind of resolution being reached. An ironic line from the character Daniel (played by Daniel Hewett) hammers this home: “I thought I used to have all these life affirming revelations… but I’d wake up the next day and still be me, and still do the same stuff.” The very final scene opens with an identical shot to the first, forming a cycle rather than an arc for the characters’ issues to follow. Despite the apparently minimal budget, Taylor has pushed what resources he has. His company’s background in commercial video lends itself to the clean visual style he’s carried forward into One Night Stand. A gentle soundtrack murmurs through the film, giving an immersive value to the party scenes. Where limitations cannot be escaped, they are in fact made into features, covered up by the faintest metaphorical lampshades: in one early conversation two women discuss how “one mistake puts [them] right off the film.” Later, after a dawn-lit swim in the river Tay, Daniel takes aim at whichever “evil person would make us do that,” between shivering gasps. The sheer realism of One Night Stand is, then, both its strength and weakness. Taylor’s writing stands out precisely because it is not flamboyantly cinematic but rather real and familiar. The film itself, though, feels painfully aware of how it’s being made.